According to the Alameda County District Attorney Office, between the years of 2012 and 2016, the corporate retail giant Target was guilty of illegally dumping 2,038 items of hazardous e-waste that should’ve been properly recycled. 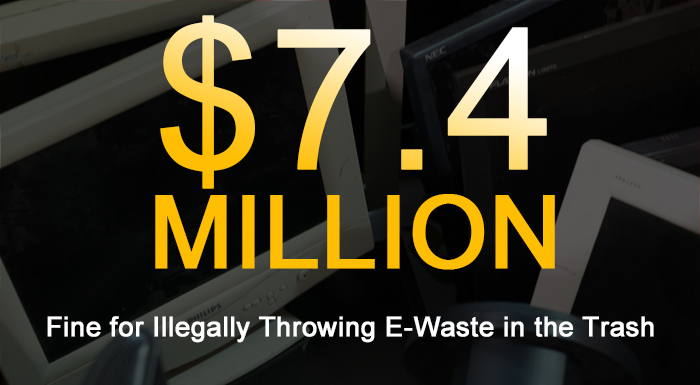 By breaking California’s e-waste recycling laws, the state of California charged Target with a hefty fine of $7.4 million dollars. The state of California takes its environmental laws quite seriously, and it doesn’t take lightly anyone that tries to break them, whether it’s a single, regular person, or a huge corporate entity. This isn’t the first time that Target has been slammed by e-waste fines, however. In 2011, Target was fined $22.5 million dollars because they had broken the rule. Let this be a lesson before any of you decide to throw those batteries away with your regular trash: don’t do it. California’s Electronic Waste Recycling Act of 2003 was created to establish regulations and infrastructure for how the state would deal with recycling e-waste. E-waste includes items such as televisions, computers, laptops, LCD screens, and any devices that contain fluorescent cathode ray tubes. Circuit boards and batteries are also included in the list. All of these e-waste products contain potentially dangerous materials that can bring harm to the environment and human beings, and so California has been making an effort to clamp down on the improper disposal of such devices. According to the California Government’s website, as part of their CalRecycle page, they require business and other public entities to recycle as much of their generated waste as is possible. There is also a mandatory law for commercial organic waste to be diverted from landfills and sent to composting and anaerobic digestion facilities to create biofuel and fertilizer for soil. If they can, California aims to reduce organic waste by 50 percent by the year 2020. To beat their own score, California then plans to hits 75 percent by 2025. What’s more, a lot of these electronic parts can be repurposed and reused. This is why California created the Electronic Waste Recycling Act of 2003, and they made it illegal to dispose of any e-waste with regular garbage. If you have any electronics that can be sold or donated, it is encouraged so long as the equipment or device is still functional. Otherwise, e-waste must be properly disposed of. How Should E-Waste Be Disposed Of? E-waste should be properly disposed of by finding organizations that recover unwanted electronics. This can be done by going to the California Government’s CalRecycle page and searching for organizations near you. They can provide you the organization’s location, services, hours, and any possible charges that might be included. Other states have their own e-waste laws, but not all do. In 2017, it was said that only 25 states and Washington D.C. had electronic recycling laws. What Does the EPA Have to Say About E-Waste? According to the EPA’s own site, the EPA supports the United States Government’s National Strategy for Electronics Stewardship (NSES). This is a governmental plan to provide recommendations on how federal government, businesses, and all citizens should move towards achieving the goals of the Executive Order 13693, also known as the “Planning for Federal Sustainability in the Next Decade”. E-waste is neither good for the environment or for your own health. It’s still not too late. With at least half of the United States now implementing e-waste recycling measures, progress has been made in bringing e-waste, as well as other waste, under control. It’s a long road, and for the states that don’t have e-waste laws or other proper waste regulations, they have an even longer road. But even if you don’t live in California, or in a state with e-waste and other waste regulations, learning more about what you can do to Reduce, Reuse, and Recycle is the first step to being able to do something, so you can make a change for your community. Looking for IT Asset Disposal Solutions? Want to learn more about your e-waste compliance regulations are in your state? Don’t hesitate to contact us! Since we started in 2003, we have been providing excellence in IT Asset Disposal. Whether it’s your electronics that need proper e-recycling or hard drives with sensitive information that need proper destruction, Securis can help!